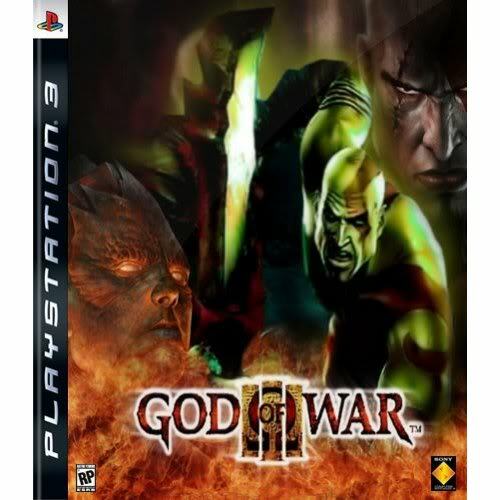 God of war as always received excellent review and fans alike and was the recipient of many awards, including “Game of the Year” honors, for those of you who are not so aware of this game, God of War video game for the PlayStation 2 console was released on March 22, 2005. It is an action-adventure game based on Greek mythology. God of War was developed by Sony Computer Entertainment’s Santa Monica division. It is the first installment of the God of War series of games and the second chronologically. God of War III released worldwide in March 2010, it is the fifth and final chapter in the current story arc, chronologically after God of War: Chains of Olympus, God of War, God of War: Betrayal, and God of War II. God of War III, however, will not be the last God of War game of the series. God of War III picks up immediately where God of War II ended, with Kratos riding on Gaia as she and the other massive Titans climb Mount Olympus to assault the gods. Combos from previous titles also make a return as well as new combos. The number of enemies onscreen has been increased to 50 as opposed to the maximum of 15 in previous God of War installments, The game features a challenge mode, like the previous installments, called the “Challenge of Olympus”. There is also a bonus challenge mode that was included in both the Ultimate and Ultimate Trilogy Editions of the game called the “Challenge of Exile”. God of war primary platform is PlayStation 3, for other on PC and Xbox you guys know how to get those or at least for God of War 3 PC version it will soon on the net bet me ;), Here is some average review score on this game: GameRankings –> 2.86% & Metacritic	–> 93/100. The Board Of Film Classification has slapped an ’18’ rating, so u are just lucky to grab an blu-ray disc of this game if you just turned 18 years old ;), it makes sense since I bet it is one of the most violent games i have ever played, I hope they make movie on this i can rest assure it can be a never seen box office hit…. Talking about the CGI cinematics in God of War 3 actually there is nothing much into the game itself but the in-game PS3 engine is plenty capable of blending the non-interactive sequences with the interactive, so there’s basically no difference, everything you see is 100% in-game. All camera features, including motion blur, run real-time in the cinematics and in-game.. The God of War 3 engine is a new game engine that Sony Santa Monica has built from the ground up and the the in-game graphics are created using the God of War III engine..
Forbes annual list of world’s billionaires is out. And this time its not Bill Gates nor legendry investor Warren Buffett on the top. 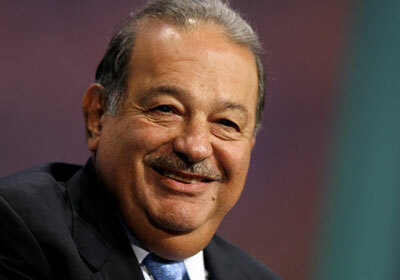 The numero uno position in 2010 list goes to a non-US billionaire, the Mexican telecom tycoon Carlo Slim Helu. With the global economy improving and with that global markets getting buoyancy back, the fortune of majority of world’s billionaires soared during the past year. In fact, this year’s World’s Billionaires list includes 97 new names, 62 of which come from Asia. And, much like every year, the list has its fair share of tech leaders. In fact there are as many as three technology honchos in the list’s top 10. Among the tech billionaires in the list, the top 10 saw their fortunes jump by a collective $55.8 billion over the past year. Mexican tycoon Carlo Slim Helu dethroned Microsoft co-founder Bill Gates to claim the World’s no. 1 Billionaire title. Gates has held the No. 1 spot for as many as 14 times in the past 15 years. According to Forbes, Slim’s fortune swelled to an estimated $53.5 billion, up $18.5 billion in 12 months. Shares of America Movil, of which he owns a 23-billion-dollar stake, went up by as much as 35% during the year. Born to a Lebanese immigrant father, Slim learned his business acumen at an early age. Slim studied civil engineering and later built up the telephone monopoly Telmex after acquiring it from the government in 1990. The softly-spoken billionaire last month received authorisation to merge three of his telecommunications companies to form a regional giant, with 250 million customers in 18 countries. Slim, a widower with six children, has handed over the daily operations of his companies to his three sons and business partners. A baseball fanatic, Slim is also well-known for his philanthropy. With a net worth of $53 billion, world’s second richest man is software czar Bill Gates. Fifty-four-year old Gates net worth went up by $13 billion during the last year as Microsoft shares rose almost 50%. According to Forbes, more than 60% of his fortune come from outside Microsoft, which includes investments from Four Seasons hotels, Televisa and Auto Nation. In 2009, Gates topped the Forbes’ The World’s billionaires list, beating investor Warren Buffett. 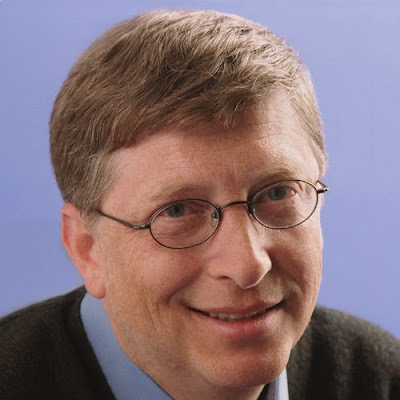 A Harvard College dropout, Gates topped the Billionaires list for past 15 years in a row (from 1993 to 2007). In 2008, he held the second spot. Born on October 28, 1955, Gates resigned as Microsoft chairman in 2008 to take up a full-time philanthropic role in the Bill & Melinda Gates Foundation. 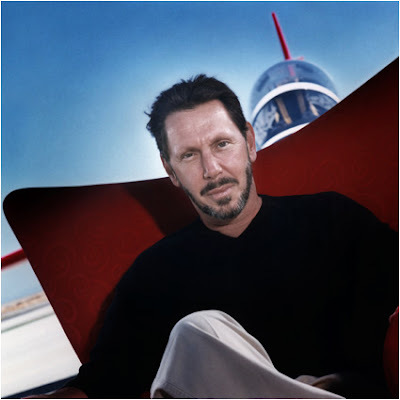 World’s sixth richest person and technology industry’s third riches person is Oracle co-founder and CEO Lawrence Joseph Ellison, popularly known as Larry Ellison. With a net worth of $28 billion, Ellison slipped two ranks down this year from 4th position last year. The company that recently closed the $7.4 billion acquisition of Sun Microsystems, last year saw its share up almost 70%. In the past five years, Oracle has made as many as 57 acquisitions, including BEA Systems (bought for $8.5 billion in 2008). The company also invested $125 million in Web software outfit Netsuite. Sixty-five-year-old Ellison started Oracle Corp in 1977. Two years younger to arch rival Microsoft corp, Oracle went public a day before Microsoft in 1986. A licensed pilot, Ellison is said to own several unusual aircrafts. Known for his flamboyant lifestyle, Ellison has got a leisure boat built for himself. Chicago native studied physics at University of Chicago, but didn’t complete his graduation. At 24th spot on Forbes billionaires list are Google co-founders Sergey Brin and Larry Page with a net worth of $17.5 billion each. Last year saw Google’s fortune going up by $5.5 billion with shares of the search giant soaring 70%. The company who is gung ho on its open source platform Android recently unveiled its first branded smartphone Nexus One. Sergey Brin and Larry Page started Google in 1998 from a friend’s garage. A native of Moscow, Brin, now a US citizen, did his Bachelors of Science degree with honors in mathematics and computer science from the University of Maryland at College Park. While following in his father’s footsteps in academics, Larry went on to earn a Bachelor of Science degree in engineering from University of Michigan. Page was Google’s founding CEO and grew the company to more than 200 employees and profitability before moving into his role as president, products in April 2001. Today, the two continue to share the responsibility of Google’s day-to-day operations with CEO Eric Schmidt. Sergey’s research interests include search engines, information extraction from unstructured sources and datamining of large text collections and scientific data. At No. 28 on the world’s richest list is the chairman of the India’s third largest software company Wipro, Azim Premji. Sixty-four-year old Premji heads $5.5 billion (revenues) Wipro, and has a personal net worth of $17 billion. In its last quarter (Q3), Wipro reported a 19% rise in profit, and projected growth as the global economic recovery boosts demand for outsourcing. In Forbes’ 2009 list, Premji stood at No. 83, with a net worth of $5.7 billion. A graduate in Electrical Engineering from Stanford University, US, Premji took over the Wipro mantle at the young age of 21, after the sudden demise of his father in 1966. Under his leadership, the fledgling $2 million-hydrogenated cooking fat company has today grown into India’s third-largest software company. The second Microsoftie on the Forbes Billionaires’ list is Microsoft CEO Steven A Ballmer. Ballmer ranks at No. 33 with a net personal net worth estimated to be $14.5 billion. After series of failed attempts to strike a deal with Yahoo, Microsoft recently signed a 10-year deal with the company under which its own search engine Bing becomes the search engine for Microsoft and Yahoo sites. In its last quarter, Microsoft earnings jumped 60%, helped by a rebound in PC sales. A college mate of Bill Gate, Ballmer joined Microsoft in 1980 and was the first business manager to be hired by Gates. He became CEO in 2000. During his tenure at Microsoft, Ballmer has headed several divisions, including operations, operating systems development and sales and support. Described as ebullient, focused, funny, passionate, sincere, hard-charging and dynamic, Ballmer is said to have imparted his own brand of energetic leadership, vision and spirit at Microsoft over the years. Like his boss, Ballmer too dropped out of Stanford MBA programme to join Gates in 1980. 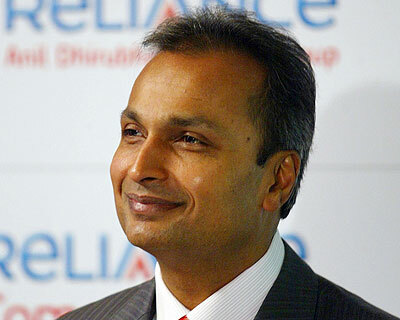 Next Desi honcho on the list is Reliance Communications (RCom) head Anil Ambani at No. 36. Slipping two positions from last year’s ranking, Anil’s net worth is estimated to be $13.7 billion, up from $10.1 billion in 2009. Last year saw the biggest fall in Anil’s net worth when he slipped from 6th position to 34th. Anil’s Reliance Anil Dhirubhai Ambani Group has interests in telecom, power, infrastructure, financial services and entertainment. Anil did bachelor of Arts/Science graduate from University of Bombay. He later did MBA from the university of Pennsylvania, Wharton School. 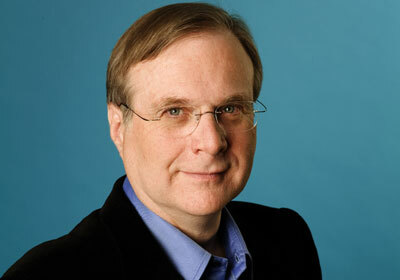 Another billionaire from Microsoft’s camp is Paul Allen ranked at no. 37. Allen co-founded Microsoft with Bill Gates in 1975. His net worth is estimated to be $13.5 billion, up $3 billion from $10.5 billion last year. Allen left Microsoft in 1983 after being diagnosed by Hodgkin’s disease. Microsoft now makes up around 25% of his net worth. Recently, Allen launched software outfit Xiant, whose product Filer helps users keep track of emails in Microsoft Outlook. Fifty-seven-year old Allen also owns two professional sports teams, Seattle Seahawks of the National Football League and Portland Trail Blazers of the National Basketball Association. Sharing position with Paul Allen at No. 37 is CEO of the world’s second largest PC company, Michael Dell. With a net worth of $13.5 billion, Michael Dell slipped 12 ranks this year. He was ranked an No. 25 in Forbes’ billionaires list of 2009. In the past six months Dell stock has gone down by nearly 10% and the company’s revenue fell by nearly 13% in year ended January 2010. Forty-five-year-old Dell started a company called PC’s Limited from a room, while still studying at the University of Texas. The company later became Dell Computer Corporation, followed by Dell Inc in 2003. In 1998, Dell formed MSD Capital and in 1999, he and his wife formed the Michael & Susan Dell Foundation, to manage the investments and philanthropic efforts, respectively, of the Dell family. Next richest techie in the list is Amazon.com CEO Jeffrey Bezos ranked at No. 43. With a personal net Worth of $12.3 billion, forty-six-year-old Bezos jumped 19 ranks this year. Ranked at no. 62 in 2009, Bezos’ net worth nearly doubled in the past year from last year’s $6.8 billion. Amazon’s stock has jumped almost 100% in the past few months. In 2009, Amazon also acquired online shoe retailer Zappos for $800 million in stock. The company which made headlines with the launch of Kindle digital book reader in 2007, saw its net income up 40% in 2008 as the company debuted Kindle 2. Bezos founded Amazon.com Inc and has been its CEO since May 1996, the Chairman of the Board since 1994, and the President since October 2000. Previously, he served as the President of Amazon from 1994 to June 1999. Bezos served as the President and Chief Executive Officer at Padcom. Before starting Amazon, he worked at the intersection of computer science and finance, helping build hedge funds on Wall Street for DE Shaw & Co. Bezos completed Electrical Engineering and Computer Science from Princeton University in 1986. That’s a lot of money to spend for this week, see u with another interesting post next week. 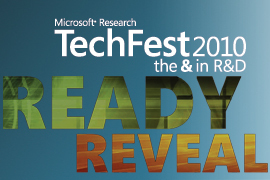 Let me first brief you about the Microsoft’s in-house Techfest which happens annually, the TechFest event is where Microsoft’s researchers from different locations around the world meet in Redmond and share their work with other Microsoft’s employees. As I said this in-house fair is closed to everyone including the press except employees, Attendees here experience some of the freshest, most innovative technologies emerging from Microsoft’s research efforts. This event provides a forum in which product teams and researchers can discuss the novel work occurring in the labs, thereby encouraging effective technology transfer into Microsoft products. So who cares if it is in-house as long as tech bloggers like me 🙂 bring out what they really upto this year. So without wasting time here is a sneak preview of some of the projects that Microsoft is working real hard.. I guess most of u aware of the Microsoft’s “Surface Computing” technology which quite old aged now, Microsoft researchers have now shrunk the company’s Surface tabletop computer into a pocket-sized package which, with a few accessories, promises to compete with any touchscreen device. Called, Mobile Surface, it is primarily a mobile version of the company’s Surface technology. It is now hooked on to a small webcam and digital projector, the Mobile Surface computer can create touch interfaces on any nearby flat surface — or even in thin air. 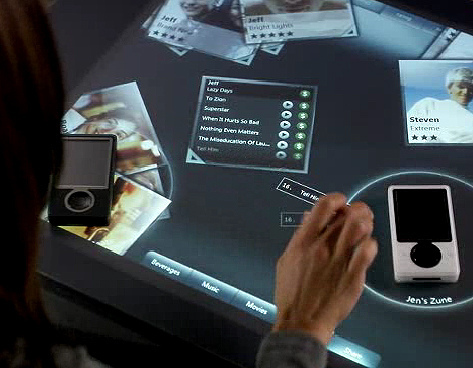 The prototype Mobile Surface device combines the features of Surface touchscreen computer along with the gesture-based interface of its coming Project Natal game control system for the Xbox 360. Microsoft has been developing technology that operates games led by a user’s wrist movements, who know a competition to our beloved guitar hero’s. The company has reportedly even developed several techniques for picking up gestures like finger twitches. 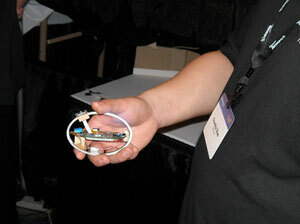 At this TechFest, Microsoft showed wearable movement sensors with a researcher playing an air guitar. Another researcher demonstrated the use of skin as a computing interface using sensors that pick up tapping motions. 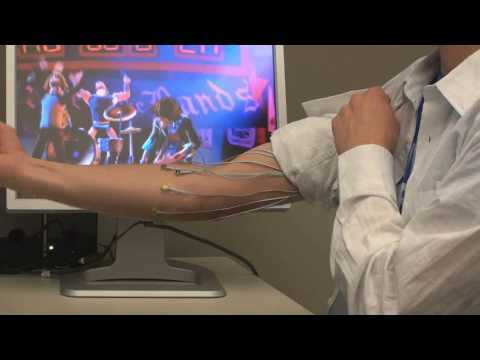 He wore an arm-bandlike sensor that could process commands from his muscle movements. He could tap his thumb to his forefinger to start playing music on an MP3 device. OneAlbum is a project under development by Microsoft Israel Innovation Labs that uses face-recognition technology to search for photos. As for how it works, OneAlbum scans faces that regularly appear in a user’s OneAlbum photo collection, then scours his social networks (Facebook, Flickr, Windows Live and others) for more photos of these people. 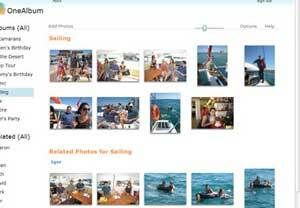 It then automatically finds relevant photos in other albums on the Internet and brings them to the user’s album, and shows them side-by-side with his photos. With Cloud Mouse, Microsoft gives a new twist to our age-old mouse. 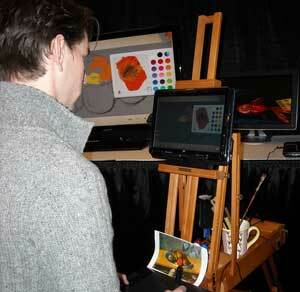 Cloud Mouse is designed to help people navigate displays of 3D data. This means instead of scrolling up and down on a Web page, a user can twist and turn through the pages. Think of a graphical representation of your Facebook network. The Cloud Mouse looks much like any other mouse just that it lacks a flat bottom and has a six degrees of freedom and tactile feedback. Plus, Cloud Mouse would also serve as a key for personal cloud data on various online services. This year Microsoft also showcased a `Translating Telephone,’ a software tool designed to let users have a real-time chat with someone in another language. The software translates from one language to another so that users on a phone call who do not speak the same language can successfully communicate. 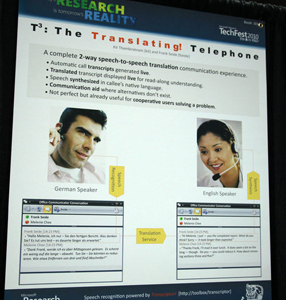 Microsoft researchers demonstrated the software by showing a live phone call between two developers, one German speaking and the other English speaking.